Utilizing the latest computer-aided-design (CAD) and manufacturing (CAM) techniques, Harmony offers total patient-treatment that meets even the most stringent oral health requirements. The Harmony system attaches to the interior side of your teeth, providing you a completely invisible treatment solution. Using the most modern technology dentistry has to offer, your orthodontist is able to design a digitally customized solution that will leave you with the perfect smile. Best of all, the Harmony system is engineered to be small and smooth, allowing the patient to adapt quickly and comfortably to his/her orthodontic treatment. 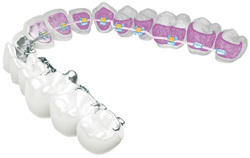 The self-ligating technology offers your orthodontist more hands-on control to achieve precise tooth alignment, and does away with elastic O-rings meaning friction is reduced, resulting in a more comfortable experience for the duration of the treatment. Harmony is designed to help your orthodontist achieve the highest level of patient treatment available, and as efficiently as possible. Dr. Picard is able to walk you through the different treatment phases should the Harmony system be the optimal orthodontic treatment solution for you.